[FTC Disclaimer] Certified Angus Beef is a sponsor of my blog; however, this is not a compensated post. When Certified Angus Beef came to my house during the holidays to talk beef tenderloin, we had to have a few of these magnificent cuts of beef for the demonstration. Since Chef Michael Ollier and Matt were flying, we got to keep all of the beef tenderloins. Too many beef tenderloins - that's a great problem to have, right? 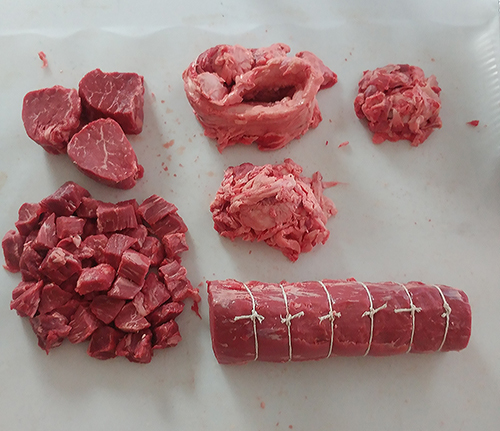 One of my favorite things to do when I trim a whole beef tenderloin is to use the bits and pieces to make the best beef tips you'll ever have. 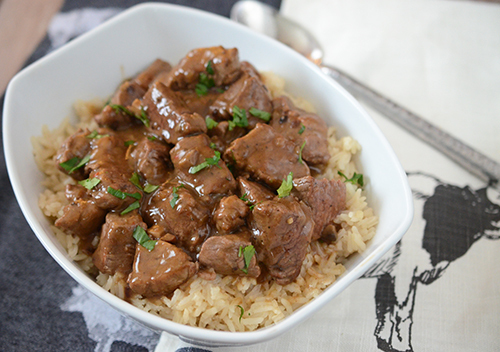 Sure, sirloin beef tips are good and you can slow cook stew meat for beef tips. 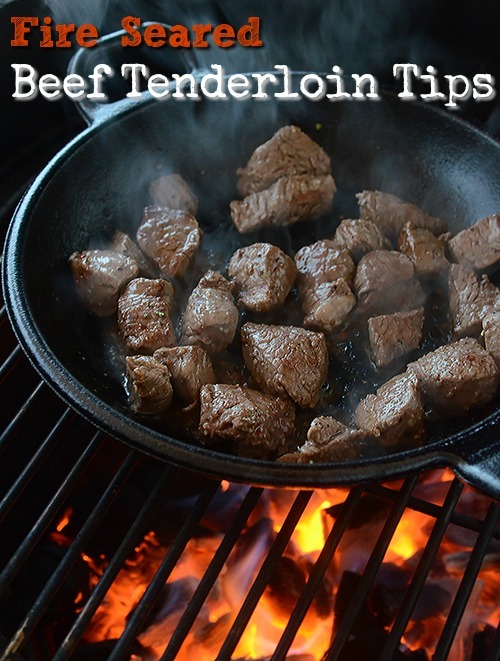 But the best beef tips come from the tenderloin. Season them with just a little kosher salt and coarse ground black pepper, saute them over high heat and you'll get melt in your mouth beefy deliciousness. I do them a little differently every time. Here's the most recent version that I cooked on the grill. For the beef rub, I used our NMT Beef Rub recipe but you can use a commercial beef rub, your own recipe, or just season the beef tips with salt, pepper, and granulated garlic. 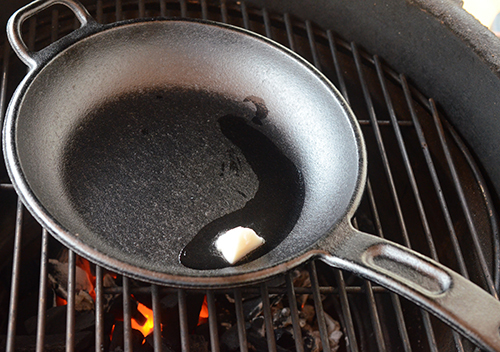 Preheat grill to 350°f and place a cast iron skillet on the grill. Alternatively you can preheat a cast iron pan on the range top. Make the rice. In a medium pot, melt the butter over medium heat and saute the onion for 5 minutes. Add the rice and continue stirring until the rice just starts to turn golden and emits a nutty aroma, about 3 more minutes. Add the 1/2 cup stock, water, and salt and bring to a boil. Reduce heat, cover and simmer for 18-20 minutes. Remove from heat and let sit for 5 minutes. Fluff with a fork. Melt tallow in the preheated cast iron pan. Season the beef with the beef rub and sear the beef tips in the pan, tossing or stirring occasionally, until the beef reaches an internal temperature of 130°f - about 6 minutes. Remove the beef to a cooling rack. Add the shallot and mushroom in the same pan and cook until starting to turn tender about for minutes. Flambe the veggies [See notes before trying] by carefully adding the bourbon to the pan and use a long stem lighter to ignite the vapors. Make a roux by adding 1 tablespoon of butter and stirring in the flour, whisking for 1 minute to combine. Add the 1 cup of beef stock in small batches while you continuously whisk. It might start to seize up, don't panic, just keep adding and whisking. Allow to simmer for 4 minutes. 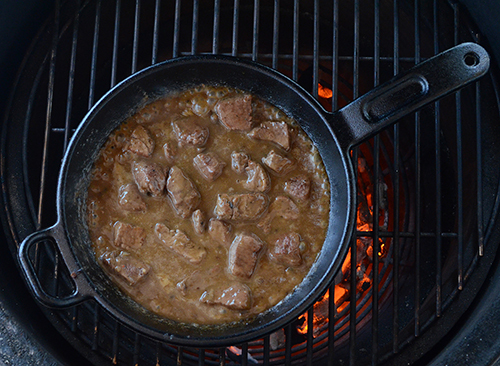 Return the beef tips to the pan and simmer 2 more minutes then remove when the sauce is clinging to the beef. Remove from heat. 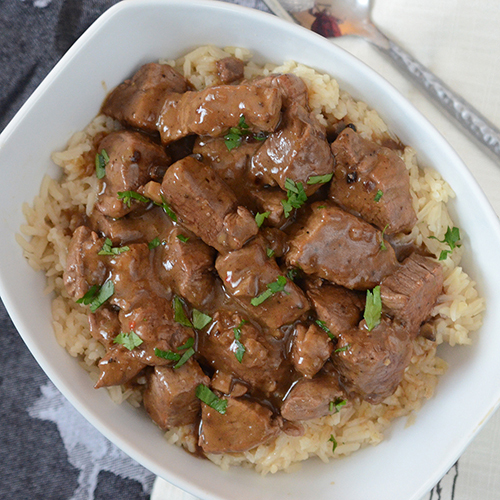 Serve beef tips over the rice. This is one beef tenderloin that I trimmed. I got three filets, beef tips, a center cut roast, fat for tallow, "the chain" and only a cup or so of waste. I bought one of these for my mom and liked it so much I got one for myself! 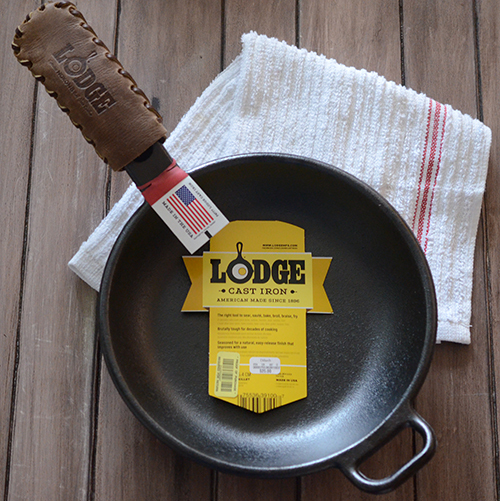 Lodge is a Tennessee company located in South Pittsburg near Chattanooga. This dish goes pretty quickly so you'll want to have everything ready. Mise en place is important in the kitchen, doubly so when you're cooking outside. I used tallow (rendered beef fat) for this cook but you can use any high temperature oil. Fire, black iron, and beef...that's a winning trio. To make the best beef tips, you have to start with the best beef. Muppet News Flash - Fire is dangerous. Before attempting a flambe, watch some videos, take a class, and take the necessary precautions. Wear long sleeve heat resistant gloves. Add the alcohol away from an open flame (off of a gas burner or grill). Have a tight fitting lid ready for extinguishing flames if necessary. Use a long stem lighter to ignite the vapors about an inch above the liquid. Use 80 proof or better alcohol. Perform the flambe in an area that is free of excessive air drafts. Strong air currents can blow your vapors away before they can ignite or worse, blow the flame your way once they do catch fire. Light the vapors pretty quickly after adding the alcohol, while it is still emitting vapors. 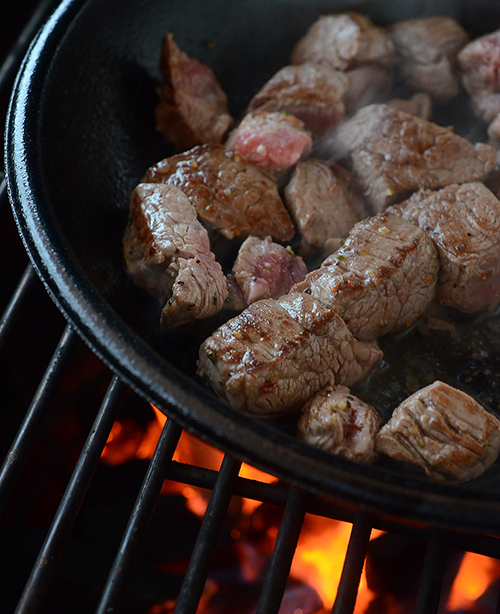 Hand your buddy your drink and say, "Hey, watch this...."
I love how this pan fits perfectly in a standard sized grill, it's already become one of my go to tools for outdoor cooking. These delicious morsels were so tender. 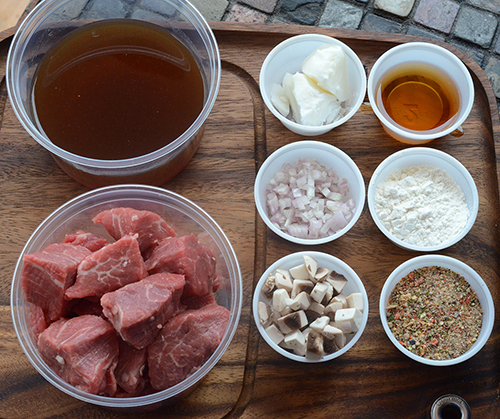 I have another pack of these beef tenderloin chunks in the freezer. 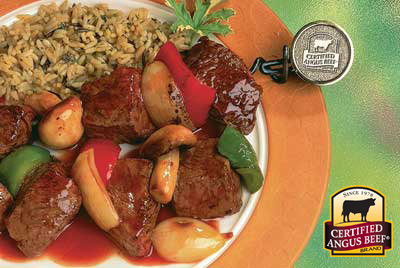 I think I'm going to make this Glazed Beef Kabobs recipe from Certified Angus Beef.